Would you like to feel Rejuvenated and Pain Free? Then come explore what an Ionic Foot Detoxification could do for you at Cleansing Waters Wellness and Weight Loss Center! Cleansing Waters Wellness Center, we use an ionic foot detox machine that is a modern energy therapy device which balances the body's natural energy system. By introducing a high level of negative ions into the water of a foot bath, the feet, utilizing principles of reflexology and the science of ionization and osmosis, create a positive cellular environment and enable the body's natural detoxification processes to function at their peak. 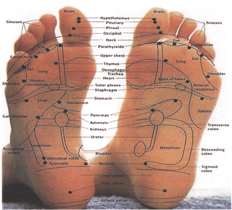 An ionic foot detox is the safest, most modern and effective natural healing therapy! Natural health care practitioners and physicians who specialize in integrative medicine, recognize the need for detoxification. Although the human body was designed to handle a relatively large amount of toxins, our modern environment is contaminated to the point that most people need assistance to regain and maintain optimum health. This is where the detox foot spa comes in. Whether you are in good health and just want to feel extraordinary, or if you are currently suffering from chronic problems or an undiagnosed illness, regular foot detox sessions can improve your over all health and well being.